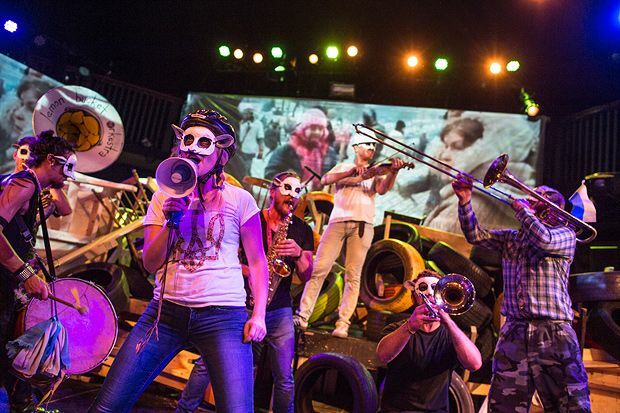 Billed as a guerrilla folk opera, Counting Sheep tells the story of the revolution in modern day Ukraine. The play is divided into titled chapters and performed to a backdrop of news reports and first-hand footage of the movement. Told through song there is only fragments of speech, spoken in Ukrainian. The singing is incredible, both emotive and haunting, and Canada's Lemon Bucket Orkestra exhibit their skills on violin and drums, creating rousing calls, furious dances or sad laments. The staging is ambitious, the banquet set transformed beyond recognition throughout the play by the actors with the help of the audience and a range of props. This is immersive theatre: the audience are not there to passively witness the revolution, they are part of it, joining the performers in food, in dance, crouching low in helmets when the danger is close and throwing bricks at the enemy. Written by a couple who met in Independence Square in Kyiv at the height of the Revolution of Dignity Counting Sheep has no defined characters, with all the actors and tech crew wearing sheep masks. There is no personal story to latch onto, which can lead to dips in the narrative, but also encourages engagement with the revolution as a movement. The focus is on the collective rather than the individual in a work that is not only exciting but an exposé of stories not making the news. Summerhall at The King's Hall, until 29 Aug, 8pm (27 & 28, 2pm & 8pm), £13–£20 (£12–£18). Immersive theatre charting the course of Ukraine's turbulent history. Ages 14+.